Specifications: blades 32" x 3/8" solid edge, 2 1/4" hi-carbon steel gang rods, 13" blade spacing, cast iron spools, regreaseable trunion mounted triple sealed bearings with wear guards, 3" x 8" hydraulic cylinder for hitch control, two 5" x 12" hydraulic cylinders for lift control, 16 to 28 degree gang angling, dual 12.5L x 16 8-ply tires on 16" x 10" 8-hole heavy duty wheels, 2 3/4" diameter slip-in spindles, 8,000 lb. rated wheel hubs and bearings, transport safety lock pin, safety tow chain, SMV emblem and hydraulic hose guide, 6" x 8" structural angle boxed beam main frame and 8" x 8" gang frames. Sizes: 13, 15, 17, 19 and 21 feet. Weight: 10,116 to 15,342 pounds. Weight per foot of cut: 664 to 778 lbs. Weight per blade: 348 to 426 pounds. Options: blade scrapers and hydraulic hose kit. Features: weight of this stubble disk provides blade penetration to till and bury crop residue with one pass over the field. 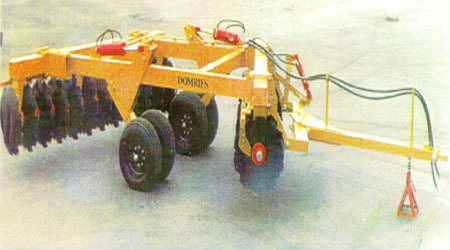 Designed for use with tractors of 150 to 350 drawbar horsepower.